After a season of ups and downs, 2016 first-round pick Jay Groome seems to be settling into a groove. Groome scattered three hits across five innings, striking out six and walking two. He now has 14 strikeouts and only four hits in 11 innings in two August appearances. Robby Sexton punched out four in two innings of shutout relief for the Drive. Roldani Baldwin continues to be a doubles machine, ripping his 31st of the season and fifth in his last six games. Brett Netzer broke out of a mini 0-for-10 skid with a 2-for-5 night. For the second straight cycle, Jake Thompson had his start postponed by rain. The two teams will play a doubleheader when the Spinners return to Brooklyn on August 31. In the first game of their doubleheader, Blake Swihart made his first ever professional appearance at first base. The 25-year-old, the top prospect in the system back in 2015, went 1 for 2 with a double and a pair of runs scored. Andre Colon, the Sox 11th-round pick in the June draft, was 2 for 3 with a double and three RBI. Pedro Castellanos also doubled as part of a two-hit day. Starter Juan Perez got the win, allowing two runs on three hits in five innings. Eduard Bazardo rolled in a pitchers duel that took only an hour and 25 minutes to play seven innings. Bazardo gave up just two hits in six innings of work, striking out three against just two walks. Kory Behenna struck out a pair in a scoreless seventh to pick up his first professional save. The Sox won despite notching only one hit, a first inning single by Everlouis Lozada. The game was a scoreless tie until a pair of walks, an error and a ground out scored Cole Brannen with what proved to be the winning run. Rafael Gomez joined the parade of starters who dominated on Monday. The 19-year-old out of Venezuela gave up an unearned run and three hits in six innings, striking out eight without issuing a walk. Yasel Santana and Luis Rivero kept things knotted up by combining for five shutout innings of relief. The new extra-innings rule played to the Sox benefit, as Willis Figueroa started the 11th inning on second base, advanced to third on a base hit, and was in position to score on a wild pitch. In contrast to the pitching clinic in game one, the Sox churned out 14 hits to complete the sweep. Jonathan Diaz had two doubles and drove in a pair of runs. Keibert Petit also doubled as part of a two-hit day, and Ivan Houellemont had three hits. Starter Rayniel Moreno allowed four runs on seven hits in his four innings of work. 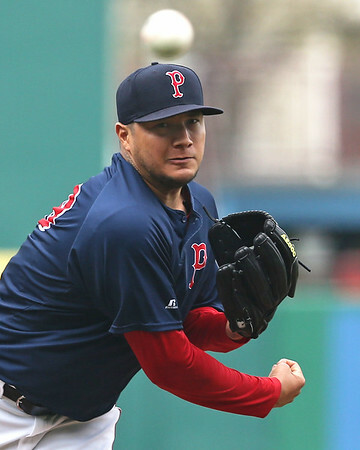 Player of the Day: As many as a half-dozen pitchers from Monday's action made cases for themselves, but the nod goes to Pawtucket starter Hector Velazquez. The right-hander, signed out of the Mexican League last winter, has been a revelation. His ERA sits at 1.93 through 84 innings at the Triple-A level, and his nine-strikeout evening gives him 67 against only 19 walks.